POSTED: Wed, 07/20/2016 - 16:00 | POSTED BY: Traci C.
If you have ever found yourself wandering aimlessly at one the of the Walt Disney World theme parks, unsure of how to get from point A to point B, wander no more! 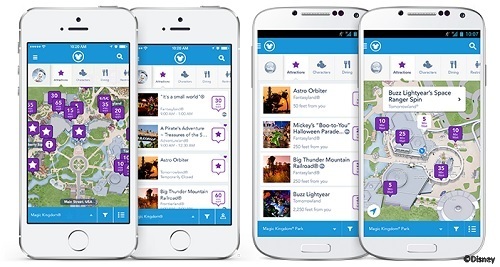 The My Disney Experience app now includes a 'get directions' function. The 'get directions' function works like this: say you're at Space Mountain and you want to get to Pirates of the Caribbean. You select Pirates of the Caribbean on the app, then choose 'Get Directions' and type in your 'from' location. A map appears that shows you the route and then you can also choose 'see walking directions' and you'll get a step-by-step route to your attraction. The function also tells you how long it will take to walk the route. The My Disney Experience app with the update is available now for iPhone and Android phones. 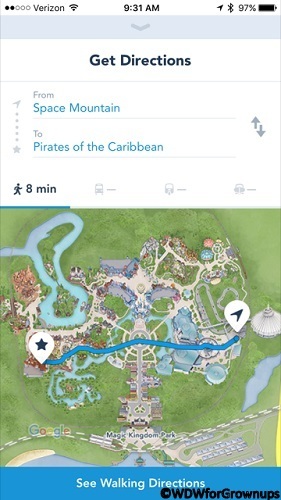 Will you use the new 'get directions' function in the My Disney Experience app? Let us know in the comments. I think I'd love this new function. I'm "directionally challenged" when it comes to map reading. First of all, I have a hard time figuring out where I am in relation to which way I need to go. I usually wind up walking the wrong way. Second, I need to have the map pointing in the same direction I'm traveling or I'll make a wrong turn. Example, if I'm heading south and need to turn eastward, I'll turn right unless I have the map turned with south facing "up." The step-by-step function will save me (and my husband) a lot of aggravation.